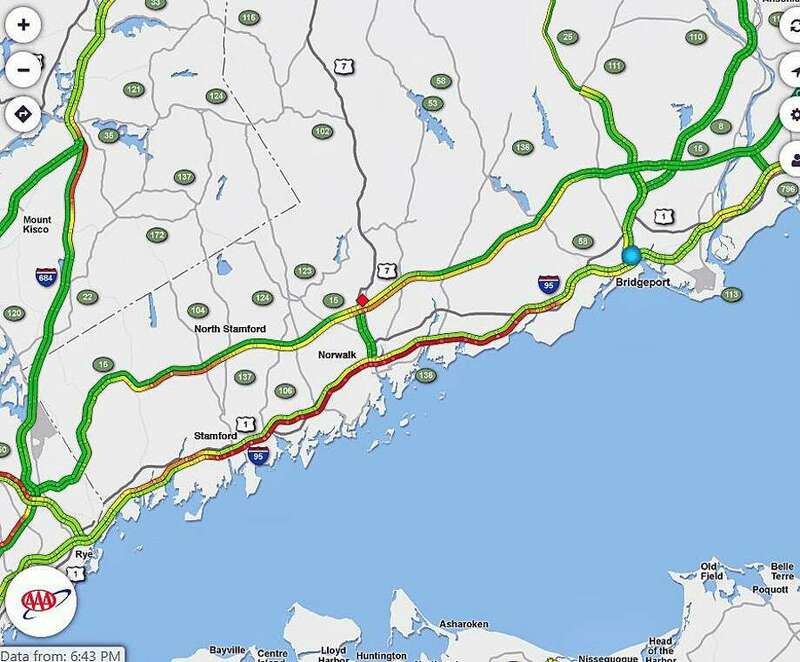 WESTPORT — A three-car crash on Interstate 95 in Westport was quickly cleared, but it also quickly backed up Friday traffic — for 14 miles. Friday night commuters and all other traffic headed north on I-95 hit serious delays from Stamford through Fairfield. The crash was in Westport between Exit 18 for Sherwood Island and Exit 19 for Center Street. The three-car crash left the right lane closed as police investigated and worked to clear the site of the collision. The crash was reported around 6:20 p.m. It was cleared around 6:45 p.m. No severe injuries were reported. Traffic was backed up for about 14.1 miles, from Exit 6 to Exit 19, because of the crash, the Department of Transportation reported. AAA reported on Sigalert that traffic in the area was stop and go around 6:40 p.m. Delays were anticipated to be up to an hour. But those that tried to hop over to the Merritt Parkway north to avoid some of the traffic on I-95 were met with some slowdowns, likely a result of a two-car crash on the southbound side of the parkway in Norwalk. The two-car crash on Route 15 was between Exits 40A and 38, the DOT reported. The left lane is closed. The crash was reported around 6:30 p.m. The crash was cleared and the lane reopened to traffic around 7:20 p.m.
As of 6:45 p.m., the average speeds on Route 15 north in Stamford were between 13 mph and 30 mph, in Norwalk between 30 mph and 40 mph, in Westport between 20 mph and 40 mph and in Fairfield between 25 mph and 40 mph.